Be the first to share your favorite memory, photo or story of LC. This memorial page is dedicated for family, friends and future generations to celebrate the life of their loved one. 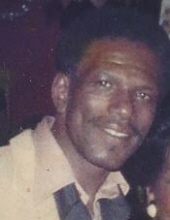 LC (Pig) Carr was born on April 22, 1944 in Florence, Mississippi to the union of LC Carr and Lessie Bell. He moved to Chicago at an early age with his parents and siblings. He attended Skinner Elementary School and Cran High School. After graduating school Pig formed a singing group called Operation Soul. During this time he was also employed at Bee Bindery Printing Company. In 1985 he began his career as a security guard, a job which he loved dearly and was very passionate about until his retirement in 2016. LC enjoyed singing, socializing with family and friends and you could always find him with a smile on his face. LC was preceded in death by his parents and three brothers A.C., Robert and John. LC leaves to cherish his memory his son LC Jr., his daughters; Linda, Lenora, Lessie and Latina. His siblings; Eddie, Walter, Wilber, Paul, Debra, Annette and Earline. His wife Elizabeth, whom he married in 1982 and her children, which he raised as his own, Stephanie, Terrie, Sharon, Carla, the late Scotty Howard and four infants that were born into heaven. LC will truly be missed by his grandchildren, great grandchildren, nieces, nephews, aunts, uncles, cousins and a host of other relatives and friends. To send flowers or a remembrance gift to the family of LC Carr, please visit our Tribute Store. "Email Address" would like to share the life celebration of LC Carr. Click on the "link" to go to share a favorite memory or leave a condolence message for the family.